For every time we have heard that said, we have also heard suggestions on how to fix it. Back in 2014, I made such an attempt, and although it was successful not only for our district, but for other districts as well, disruption in the professional learning space, has been limited. Schools want their educators to learn and grow, but in practice, professional development is innately broken, or even in some situations, nonexistent. As a result, individual educators are frequently left to manage their own development, which hasn't necessarily been a bad thing. Schools can offset where their ability to provide personalized, high-quality professional development falls short, by encouraging and supporting enrollment in online professional development courses, which are now readily available, and offer content that is relevant to most 21st century educators. Course topics range from makerspaces, such as this makerspace course of mine, to this soon to launch design thinking course taught by Michael Cohen, to professional book studies, such as this one, based on The Pepper Effect, written by Sean Gaillard. Online professional development courses, allow for anytime, anywhere, self-paced, personalized learning. Since educators have taken it upon themselves to already use online courses to acquire new knowledge to enhance their professional practice, school leaders have an opportunity to harness this kind of learning to serve the needs and goals of their districts. Some districts have realized this and have begun partnering up with organizations such as Participate, S&S Worldwide, or Code.org, to enhance their professional learning. Many districts have also begun to provide opportunities during the hours of the school day for professional learning, such as this Professional Growth Period, started in my district by my former principal, Eric Sheninger. Unfortunately though, many districts have yet to fully embrace all that online professional learning can be. Many teachers enroll in online professional development courses, pay out of pocket, and don’t even tell their districts that they are taking the courses, despite their relevance. 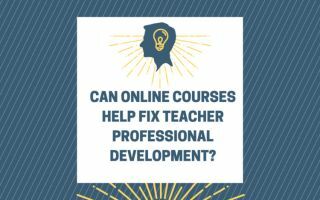 It isn’t as if teachers are withholding this information for a negative reason, but simply because many that enroll in online professional development are doing so for their own sake and because of their own interests. However, if school districts knew, they would be able to benefit greatly. Online professional development offers many advantages: the cost is oftentimes lower than attending an event, the courses can be completed during the hours of the school day, making them less disruptive than traditional courses, and the content oftentimes includes more than that which can be provided at a local, district level. By encouraging enrollment in online professional development courses, districts can enhance the development of their teachers. They can even support these efforts by allowing for time to complete coursework during the school day, and even providing support within the district for those enrolled in the courses, supporting teachers who are new to the digital professional learning space. Many teachers express dissatisfaction with professional development within their districts, despite their own learning being something they greatly value. Supporting teachers to pursue their individual professional learning paths can be a powerful culture builder by improving job satisfaction and morale. While many teachers appreciate choosing their own online professional learning courses, it is beneficial for districts to guide them in taking courses that are relevant to their practice and meet quality standards. This will help both teachers and districts not waste their time or money. Districts can help guide teachers in their decision making. Courses can also be piloted in districts, with one person taking the course and reporting back to their peers on their satisfaction with the course, creating a pool of district recommended courses for teachers to be able to choose from. Online courses taken by individual teachers, can be a consideration in teacher evaluations, as well. Rather than just tracking course completion, however, districts should strive to capture and celebrate this type of professional learning. The type of system a district puts in place to do so, should be one that helps teachers deepen understanding of applying course concepts to add richness to their instruction or professional practices. The system can be evidence-based (similar to my digital badging initiative mentioned earlier), or alternately, teachers can even devise plans for how what they learned in the course will be implemented into their practice. Online courses are everywhere now and are already playing an important role in the development of individual teachers, however, have not yet become mainstream. As more and more teachers choose to seek out these online professional learning opportunities, districts should be devising plans on how to support their teachers on their journey. Doing so will benefit teachers, districts, and of course, ultimately, our students. In this digital age, we our having to think differently about professional learning and development. In terms of individual teachers seeking out their own professional learning experiences and creating their own path, we need to think further about how we can better personalize and customize these experiences. Ultimately, I envision (and only wish I had the skills to develop) an artificial intelligence, edu-specific cognitive system that would get to know each individual teacher, collecting and analyzing data to infer what areas they could benefit professional development in, providing them with even more guidance and support in making their choices. Such a system would get to know and understand the skills, interests, strengths and weaknesses of individual teachers, ultimately providing them with personalized learning recommendations, and maybe even pointing them to specific courses. Who wants to develop that solution with me?